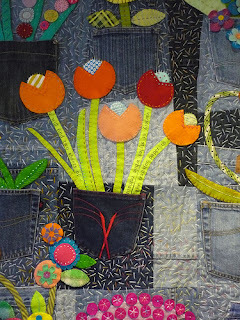 My flowery denim quilt is quilted and bound and hanging happily on my wall!! I wasn't sure if my plans for quilting using big seed stitches would work but I'm really please with how this it turned out! I chose this style of quilting for a few reasons. 1) One of the things I was hoping to achieve with the quilting was to make the pockets stand out from the background. The flowers are so bright and such a great contrast to the denim that they almost overshadow the fact that they are growing out of pockets. I think the stitches really succeed to help change the background so the pockets become more obvious. 2) Doing this sort of random stitch is so much easier than quilting a neat even running stitch through denim. In fact I'd say it was a breeze sewing through the layers or denim, batting and a cotton backing. Even the lumps and bumps of the seams didn't stop me and my needle. I guess I should mention what needle I used. I'd love to be able to give technical details of a size and brand but it's just one from my pincushion of odd needles. It was strong enough that it didn't bend when I tried it so that's the one I used. 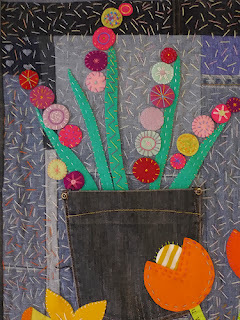 4) The quilting gives the quilt another textural element. It's got soft fluffy wool, tough denim and the stitches add a graphic softness to the look. Almost like rain. They also blend the contrasting patches to once again help the flowers and pockets become more of the feature. 5) Last but not least it's fun to try something different. There's an area of the Double Denim Wedding Ring quilt that I sewed these big seed stitches and really liked the effect and found it so much easier to sew, so I thought I'd like to try quilting a whole quilt like that. 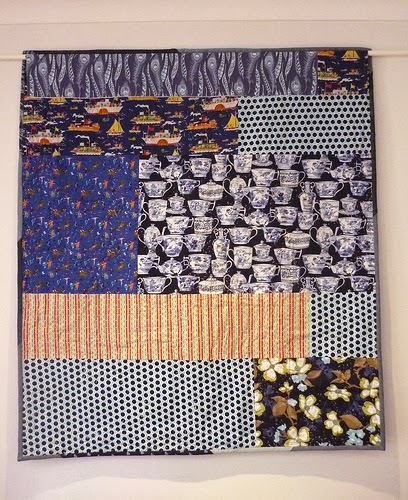 The quilt finished up at 50 inches x 43 inches, and designed as a wall hanging. I wouldn't suggest this type of quilting in a quilt that was going to be handled a lot as the stitches might get pulled. Although saying that I'm pretty rough and tough with my quilts and bundle them up and toss them around and I haven't had any problems with catching the stitches. I used a yarn that I've had for more than 5 years. 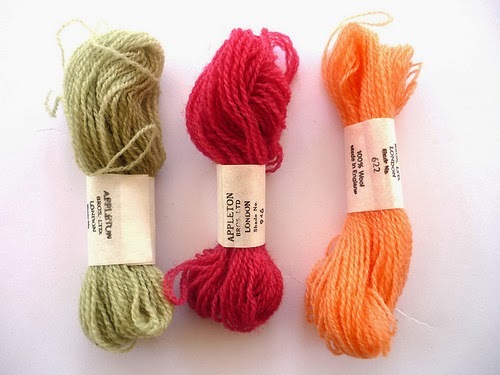 I bought book about crewel embroidery with a kit that included lots of skeins in all the colours of the rainbow. 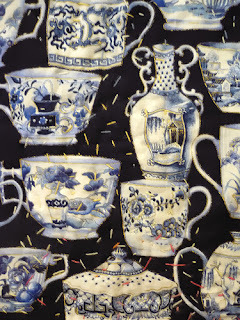 I discovered quilting soon after and the idea of doing crewel stitcheries was forgotten. It's great to be able to finally using it for something. The label doesn't say what ply the yarn is is but it is 100% wool. Perle 8 would also work well but I liked the way the yarn had more of a matt finish than perle cotton does. Here's how the stitches look on the back of the quilt. Just like random stitches. Using busy fabrics for the backing helps hide messy stitching. I always have fun picking fabrics for the backing. Especially piecing combinations of fabrics that would normally never go together. The only thing missing on the back is the label. When I first started this quilt I thought Pockets Full of Posies would be a fun name but then I find myself calling it the Denim Garden quilt. So it's not officially named yet. I thought I'd put it out there and see which is the most popular choice. So what do you think should I call it ? I love it - the quilting is fabulous! I'd call it Pocket Full of Posies!! 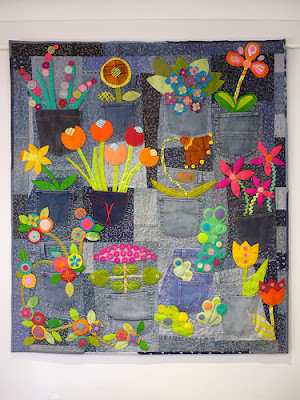 I vote for Pocket full of posies and I LOVE this quilt, absolutely wonderful ! I think it looks fabulous! 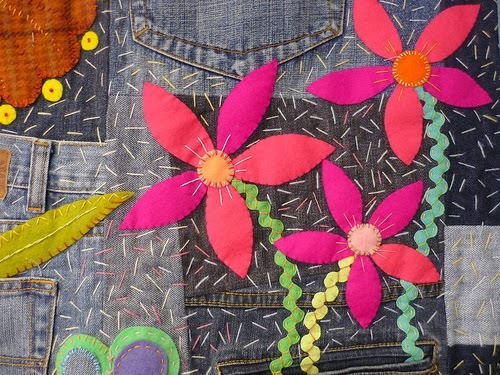 I love the design and using old jeans is great recycling. ps also love the teacups on the back. What an incredible quilt! It's just stunning Rachael. Your quilt is amazing! Yes, I think you should call it Pockets Full of Posies. The seed stitching is perfect Rachael, it really adds another dimension to an extraordinary art work. I love it. I think Pockets Full of Posies is a great name too. This quilt is a winner! Love, Love, Love it. Looks absolutely fabulous! 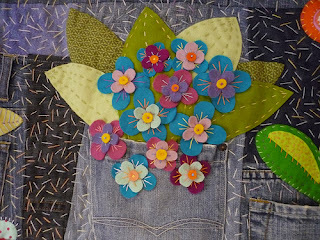 Make it a mix...my denim posies! The best name for it is what you like...but....Pocket Full of Posies is my favorite. It turned out fabulous Rachael ! Any other quilting wouldn't have worked...the seed quilting is perfect ! simply amazing. Just love your quilt - and I would go for Pocket full of Posies too! You are seriously creative. Fab. Oh, now that is adorable! I love the name Pocket full of Posies! I like Pocket full of Posies too! what a great name for this wonderful quilt. The flower bunches are so cute and the stitching is wonderful! congrats on a really fun and wonderful quilt!! Pocket full of Posies!!! I LOVE the quilt. The stitching on it is amazing ! Congratulations on a great finish that will last in the blog-world and beyond forever! Very very lovely quilt ! I love everything about this quilt. It's been great to watch it evolve. Thanks for sharing the process. 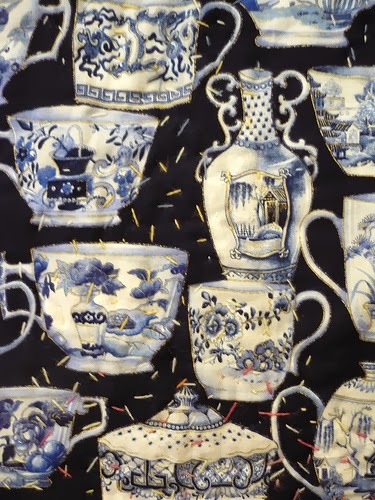 I have thought about doing this type of quilting, but worried I couldn't make it look random enough with stitches going in multiple directions. Any advice on how you managed that? This has to be one of my all time favorites! I like Denim Garden. You certainly have a creative gift, Rachel...This needs to be in your next book for all to see. 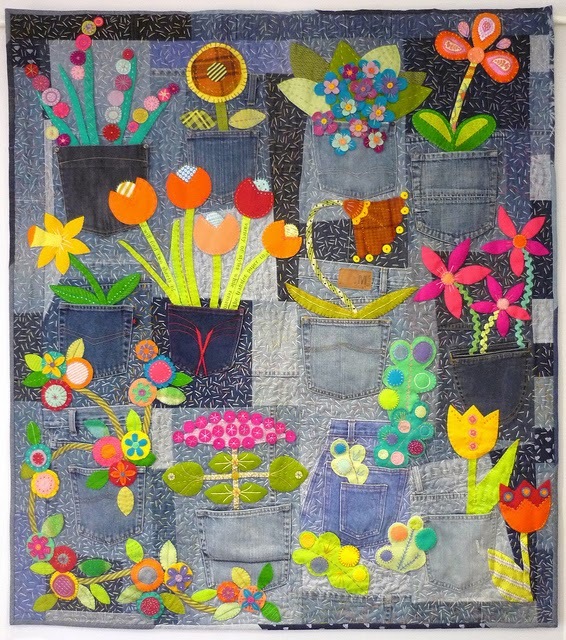 Denim Garden is my choice, but whatever the name, the quilt is a winner. I vote for Pockets Full of Posies. Love all that quilting!! It really makes the quilt special. And it does exactly what you hoped--makes the background recede and adds texture. Awesome! 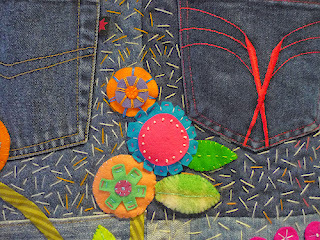 I vote for Denim Garden, mostly because there would be no doubt about which quilt you were referring to. Congrats on a job well done! I'm a sucker for a clever name, so Pockets full of Posies is my vote too! I love that seed stitch quilting. I bet it was challenging to keep the stitches on the back short too! But it does exactly what you wanted it to do. More good ideas to file away! A pocket full of posies was what I immediately thought of when I saw the quilt at the beginning of the post so I vote for Pockets Full of Posies. It's absolutely wonderful!!! Your seed stitching adds so much. I love those creative solutions--originally yours. Call it whatever you will. I'll call it Fabulous! This is fantastic! 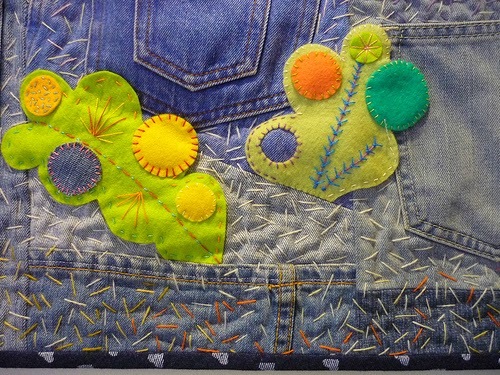 The texture if the wool appliqué, denim and quilting are perfect. So whimsical! Denim Garden is a perfect name. I LOVE this quilt. It's so fun and bright and original! 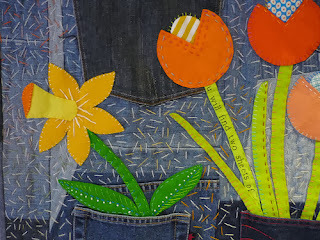 I like the bright flowers set against the soft denim. My vote is for Pocket Full of Posies. Neat quilt!! 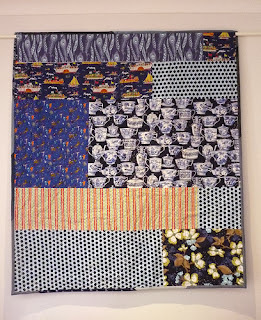 Just incredible - I absolutely love how you have quilted this - it fits the quilt perfectly! A Denim Gargen gets my vote. The quilting is genius! It does exactly what you intended. This quilt is absolutely beautiful - I love the back. Your quilt seemed to come together really quickly, but I look at it and see hundreds of hours of work!! Thanks for all of the pictures and details. One day I'm going to work with denim and this will be a nice reference! "Pocket Full of Posies" gets my vote. The quilting is perfect, I think it looks like the flowers are "seeding" to ensure another beautiful bloom next year. Oh! I just thought of another name "Bloomin' Pockets" - a bit Alf from Home and Away lol! Aaahhhh !!! I love it even more with all the gorgeous quilting on it. Wow, Wow, WOW! This ended up so out-of-this world fantastic! I'm blown away by your creativity and your talent. What a lot of work went into this beauty. Love the denim, love the pockets, I adore your wool flowers - so bright and cheery! - and I think your quilting is just brilliant. I would call this a rousing success! This is a wonderful finish. Your quilt is even more stunning with the quilting done. I think you have definitely achieved your aim with the quilting. And the flowers are so full of character I want to reach out and pick them. I like the pocket name but it is a shame that denim is not in there somewhere. But I can't work out how to do it. Congratulations on a wonderful quilt. I love this Rachael! I love the seed stitching! What a great idea! I may need to borrow that one sometime;) thanks for showing the back..I was wondering how it would look. And, of course, it looks great! My vote is for "Pocket Full of Posies"!!! I just love that name. Your quilt is beautiful Rachael. I love that you did the large seed stitch quilting. It's perfect!!! Hard to go past Pocketfull of Posies I reckon. That was a clever idea about using the quilting to increase the contrast between the pockets and the rest of the denim. I hadn't noticed the lack till you pointed it out but the difference is significant. That's what my sister in law would tell her students is putting on your "artist eyes"! I can see how the woollen stitches add that textural depth. This one might be my new favourite! I love the name Pockets Full of Posies but I love the quilt even more. Such a fun design and the quilting is perfect. Thanks for helping me smile today. Ditto on all your other comments, it's so wonderful. Just gorgeous!! Pocket full of posies is my fav :) but either name is good. A perfect hanging quilt to cheer up your day. Your quilts are the very BEST. I love this one so much. I love A pocketful of Posies, just gorgeous!! I think this is the happiest quilt I've ever seen! I can't even tell you how much I love it. I wish you'd make a pattern for it, I'd buy it in a New York minute. This is beyond fabulous!!!! Adorable quilt. I vote for Denim Garden. Both names are fabulous Rachael but I do like Denim Garden! Good luck with your choice...not an easy one! How fantastic are those stitches!!! just absolutely amazing - I'm in awe !! I just love this quilt! Love your quilting choice! It is just a beautiful quilt. Pocket Full of Posies, this is gorgeous!!! What an inspirational quilt! Love it. I vote for a Pocketful of Posies. Good Golly Miss Molly, uh Rachel, you sure like to stitch! I love all your repurposed denim projects! I'm also a big wool fan so loved that you used that for your motifs too. I have also used that big stitch seed stitch on a quilt and you're right great on texture and easy and fun to stitch. I'm curious, what did you finally name it and more importantly did you label it?